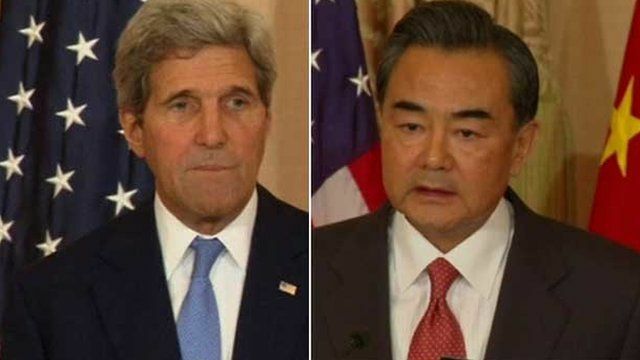 US-China divisions over HK protests Jump to media player China's Foreign Minister Wang Yi, who is in Washington meeting US Secretary of State John Kerry, says protests in Hong Kong are "China's internal affairs". Leung: End protest immediately Jump to media player Leaders of the pro-democracy movement in Hong Kong must call off the current protest immediately, the territory's chief executive warns. Thousands more join Hong Kong protest Jump to media player Thousands more people have been joining pro-democracy protesters in Hong Kong, ahead of what organisers hope will be the largest day of protests so far. Protesters 'clean up' after calm night Jump to media player Thousands of pro-democracy protesters have continued their demonstration in the heart of Hong Kong's financial district. China's Foreign Minister Wang Yi, who is in Washington meeting US Secretary of State John Kerry, insisted the protests were "China's internal affairs".